REC N-Peak panels enable you to pack in maximum power into a limited space achieving higher power levels with fewer panels. REC N-Peak Series uses the most efficient cell technology in the industry, capturing more sunlight thereby providing more power. Not only are they super efficient they are also super strong with their extra support bars allowing them to take more pressure than conventional panels. 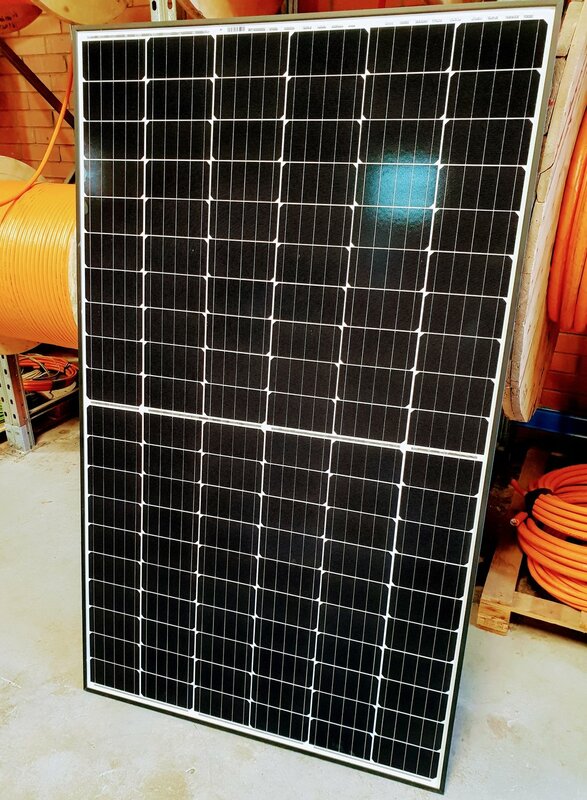 REC N-Peak panels are backed by a 20year product warranty but because Cableair... are REC Solar Professional installers, trained and certified by REC when you have your panels installed by Cableair you get an additional 5 years making it an amazing - 25 YEAR WARRANTY! So what are some of the reasons you should turn your home into a Smart Home? Efficiency- Control many different parts of your home directly from the phone or tablet. When you have full control over the lighting, the air conditioning, reticulation, and more, it means you do not have to worry about leaving items on when you leave the house, you can also program your Smart appliances or lights to operate only when needed. Convenience- Imagine turning on the air conditioner using your phone so when you arrive home from work its beautifully cooled. You can turn on the kettle from bed in the morning or turn your reticulation on or off from your phone or tablet, there are a myriad of ways to save you time and make your busy life that much easier. Security- Smart lights are great way to increase your security at home. Control your lights when you are home or away with a touch of your phones screen. Open and close your garage door to allow deliveries to be safely left inside your property without having to answer the door or even be home. Your choice of $600 worth of selected iZone Home Automation products with the purchase of any fully ducted air-conditioning system inclusive of the iZone Nexus 435 or iZone Nano 425 Controller from Cableair. iZone Garage Door control has arrived! 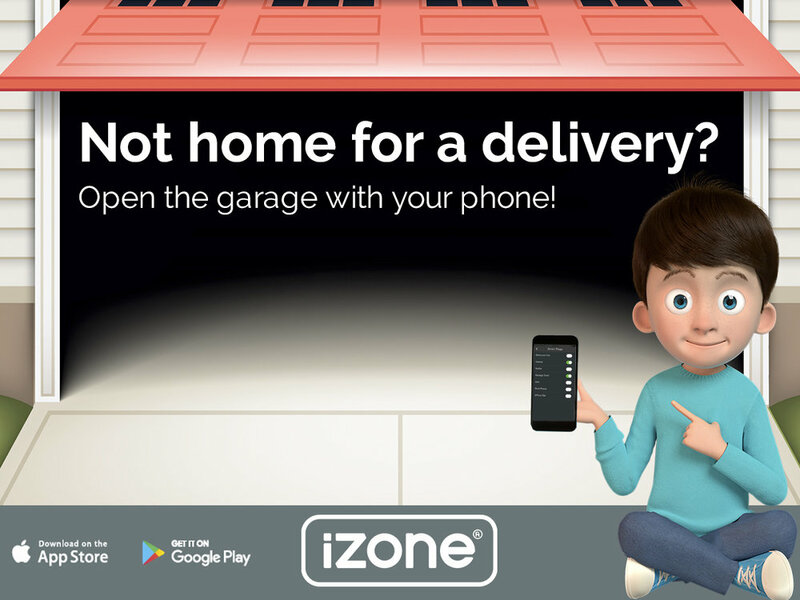 iZone is compatible with most garage doors that allow a voltage free wired connection. Call Cableair to find out what garage doors are compatible. iZone Naked has arrived at Cableair! Multiple Naked remote controllers can be paired to a single system. 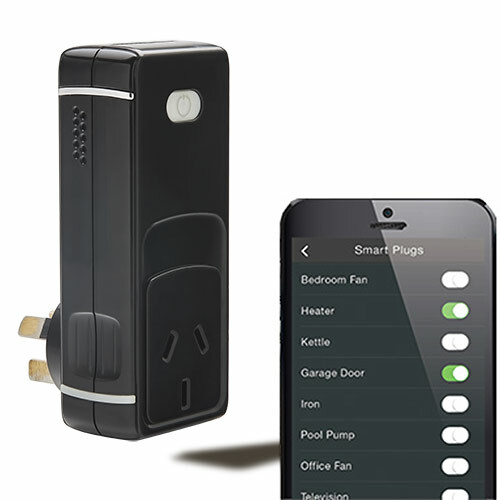 This is an inexpensive way to make your ducted air conditioning system a smart one plus the system can be added to or expanded to a full Smart iZone system with touchscreen, Wi-Fi, individual room temperature control, lighting control, garden irrigation, garage door and appliance control at any time. Zone naked comes with a choice of two different wireless remote controls, one is fully integrated with the ducted air conditioning system allowing you to control temperature and fan speed, the other is for Zone control only allowing you to open and close zones as well as adjusting airflow to each zone. iZone Smart Plugs are now here! We have another great new addition to add to our 'Smart' iZone range. Plug in any ordinary device to your iZone Smart Plug and control it from your smart phone, tablet or iZone touch screen. Transform any appliance into a smart appliance. Just imagine you can control lamps, fans, heaters, turn off and on your iron, even turn on the kettle by plugging it into an iZone smart plug. Not only will this make your home more energy efficient but think of the safety and security benefits of controlling these devices from your smart phone when you are away from your home. Call Cableair 6142 2056 to find out how you can add in the iZone Smart Plug to your iZone Smart Network. iZone Garden Reticulation Has Arrived at Cableair! The Smart Home just got smarter with the arrival of iZone garden reticulation systems. With the same great features and reliability of iZone air conditioning controls, iZone Retic is the next progression in simple cost effective home automation. Watering the garden has never been more convenient. 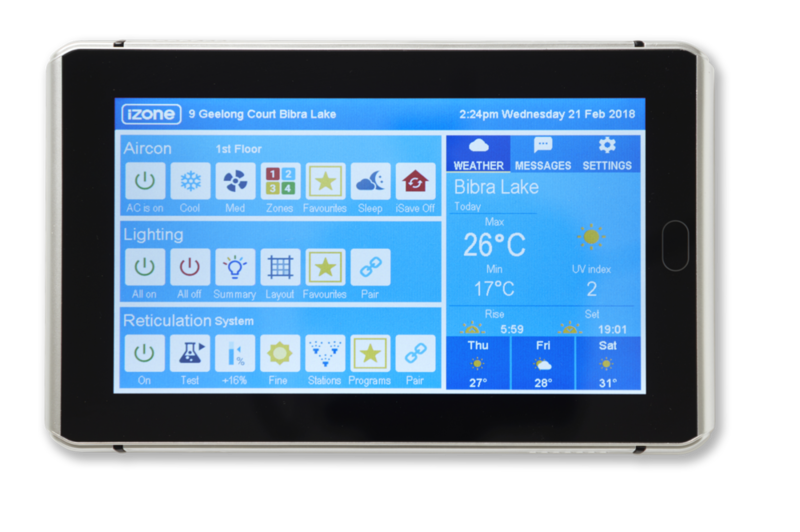 The retic controller can be fully integrated and controlled from your iZone touchscreen, your smart phone or tablet. Unlike conventional retic controllers, iZone takes the frustration out of setting up and or re-programming your retic system. Standard 8 station system expandable to 24 stations. Automatic alerts if faults are detected on any solenoid valve or field wiring. Built in Soak and Cycle feature to automatically break a watering cycle into smaller periods, with a predetermined soak time between each watering cycle. This feature will ensure maximum efficiency and minimise run off. Can be used as a standalone reticulation controller or can be fully integrated into your iZone system. Includes an IFTTT weather forecast to automatically delay watering if rain is forecast, saving you money and our precious water resources. Globally increase or decrease system watering times at the push of a single button. System “Test” button to make sure everything is working correctly. Works with Google Home, Apple, Android and IFTTT. Will operate even if the internet or WiFi are lost to the home. Maximum flexibility with 9 programs and 9 schedules. iZone even calculates and advises you the estimated finish time for each schedule. Screen messages tell you which programs are running.